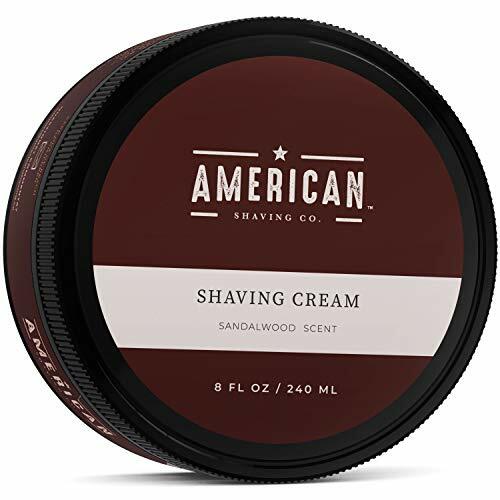 Designed for men who want the closest, most comfortable shave possible, American Shaving Shaving Cream provides a rich, luxurious lather that protects skin and softens the beard for a smooth, effortless, irritation-free shave. 1. Always prepare your skin and beard with a hot shower before shaving. 2. Lather up a dime-sized portion of shaving cream with your hands or shaving brush (preferred). 3. Apply to skin using gentle, circular motions. 4. Begin the best shave of your life, preferably with a DE safety razor or straight razor. 5. Rinse with cold water and finish with American Shaving After-Shave Balm. Tip: For best results, begin your shave with American Shaving Pre-Shave Oil. American Shaving Co. was founded with a rebellious spirit and lofty objective: To offer expertly crafted shaving products at a revolutionary price, while leading the way for a better shaving experience for men everywhere. We dreamed of a line of traditional shaving products that looked and felt like they were created for the modern man. We yearned for products that put the utmost importance in top-notch ingredients, masculine scents, and quality skin care. And we longed for a premium barbershop shave you could get at home at a fair, affordable price. Fed-up with using other subpar and/or overpriced products already on the market, we set out to create a line of products that we loved to use. And so, American Shaving Co. was born. American Shaving Co. is our dream realized. Our customers love using American Shaving, we love using American Shaving, and we know you’ll love using it too. American Shaving Co. products contain no fillers, additives, parabens or GMOs. We pride ourselves on creating aromatic, luxurious, effective shaving products that all men can enjoy. WHAT IT DOES: This men’s shaving cream contains the best combination of natural ingredients for men to achieve the closest, most comfortable shave possible while preventing irritation and eliminating razor burn. WHO IT’S FOR: Men of any age with any skin type who want to experience a premium shave while protecting against all forms of skin irritation caused by razor burn (nicks, cuts, tugs, ingrown hairs, rashes, and red bumps). Whether you have the most sensitive skin or the coarsest of beards, American Shaving Shaving Cream will allow you to enjoy a smooth, pain-free shave. HOW IT WORKS: A warm, rich lather hydrates and softens the beard while helping your skin to become very supple and flexible. This allows your blade to effortlessly glide across the skin and cut coarse hair with ease. American Shaving Shaving Cream will leave your post-shave skin feeling soothed and refreshed every time. SANDALWOOD BARBERSHOP SCENT: The first thing you’ll notice with our premium shaving cream is its masculine, enticing sandalwood scent, a signature sandalwood blend specifically formulated to impress and invigorate your skin. SATISFACTION GUARANTEED: The best shave you’ve ever had, or it’s free. If for any reason you aren’t 100% satisfied with your purchase, we’ll give you a full refund, no return necessary. Taxes and shipping included. No questions asked. This entry was posted in Wet Shave and tagged AMERICAN, Barbershop, Best, Cream, Irritationfree, Lathering, Leaves, Men's, Natural, Premium, Sandalwood, Scent, Sensitive, Shave, Shaving, Skin, Smooth, Soap.